Charles Court Opera’s alternative panto offering of 2018, Buttons: A Cinderella Story, is on the money – impressing with a talented ensemble, quality production values and enormously funny (if not-so-innocent) gags. 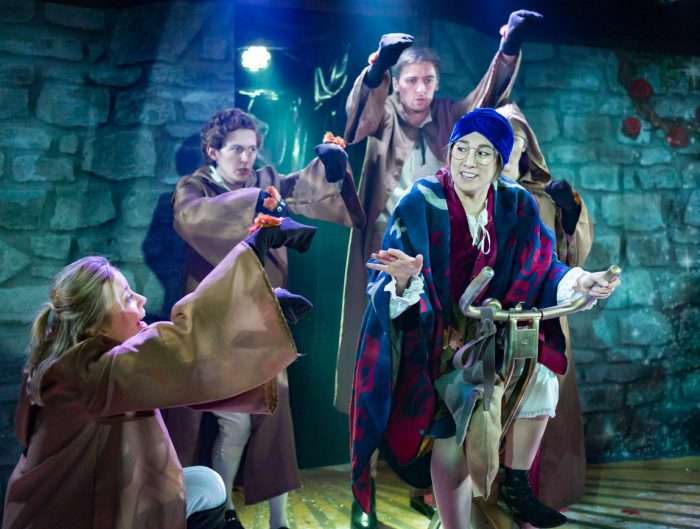 The King’s Head Theatre is onto a winner with Buttons: A Cinderella Story, with versions suitable both for young kids and ‘adults only’ – and an excellent cast who each make their mark right from the beginning. Some stand out for their ‘face pulling’, others for genuinely impressive voices – and all for pulling off the countless naughty gags peppered throughout an enormously funny production from Charles Court Opera. Cinderella’s teddy – Buttons, until he’s given a similar but ruder nickname – is the unlikely hero of the acclaimed company’s twelfth panto venture. He (Matthew Kellett) is adored by his glass-slippered owner (Eleanor Sanderson-Nash), and does everything he can to prove he can be more than just a teddy to her… Director John Savourin plays the thoroughly loveable dame, ‘Mumsie’, and elsewhere, Jennie Jacobs demonstrates ample flair for comedic acting as a millennial Prince Charming ‘down with the #MeToo movement’ for little reason other than to win Cinderella’s affection. Cue the much-needed unearthing of that truth, and the revelation of his shady side. The music, costumes and choreography match the rest of the performance – with regards to both quality and entertainment value. Only in adult pantos like Buttons: A Cinderella Story can you expect to see someone in a fully-stuffed teddy bear costume singing Radiohead’s Creep to a sleeping Cinderella, spectacularly silly hip-hop parodies and the words ‘gender normative’ to be thrown around in the same show as a lot of pastry. This sophisticated and silly, in equal measure, alternative telling of the glass-slippered princess’ story impresses for being outlandish, fun, embracing and building on well-loved panto conventions and for its healthy dose of not-so-innocent jokes.